This morning’s post will be a bit lengthier, as we have a storm of substantial interest in the forecast for today. The general summary is that low pressure moving through Southern New England will bring heavy precipitation to the region today, some of which will fall as snow. Who exactly sees snow vs rain and how much that snow accumulates is where the tricky part of the forecast comes in. This appears to be a mostly snow event for the mountains, especially at higher elevations above 2,000 feet. 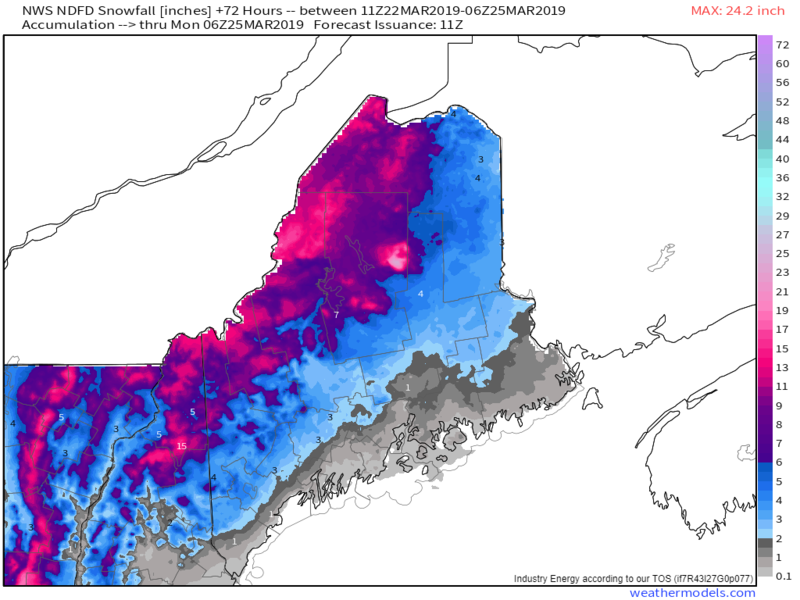 Here, 12-18″ of snow is likely through the day today. Wax up those powdah skis and wish your boss a nice weekend, this might be the last time for a while we can enjoy smooth powdery turns. Expect temps around 30 this morning to drift up towards 32 this afternoon. What an interesting and tricky forecast for the foothills. Lewiston is reporting 34 and light rain as I write this a little before 8 AM, but an area of heavy precipitation awaits just offshore. As those heavy bands move in, air will begin rising rapidly through the atmosphere, cooling as it does so. Additionally, the process of melting snowflakes will begin to take warmth out of the air via latent heat exchange. The net result will be a dynamic cooling of the lower atmosphere to right around 32F, which will allow for a changeover to snow. Here’s a visualization of that changeover as the heavy banding arrives. Snow that falls during this time will be heavy and wet, but could accumulate relatively efficiently given strong dynamics aloft. As we move later into the midmorning hours, warm air will attempt to resume its march northward. Exactly how fast this process plays out will be critical in determining which parts of the foothills get 4-8″ of snow, and which get 2-4″. Higher elevations will hold onto snow longer. Eventually by later this afternoon, precipitation will lighten in intensity and once we remove the dynamic cooling processes, we’ll likely get the changeover back to rain. Temps will hover right around freezing this morning before rising into the mid 30’s this afternoon. It should be noted that warm air has a notoriously hard time invading the foothills, so there is an outside chance that those areas remain around freezing for the rest of the day, and a wider swath picks up more than 6″. For those areas that do see several inches of heavy wet snow, power outages are something you should be prepared for given the weighing down of tree limbs and the potential for some breezy conditions later this evening. Along the coast we have another tricky forecast. Many coastal sites are reporting light snow or mixed precipitation this morning, and with the heavy precip banding now trying to move onshore, it’s possible that dynamic cooling briefly sustains this. A brief coating-2″ is possible in the next couple hours before a changeover to heavy rain. Some embedded thunderstorms are even possible in Penobscot Bay later during the lunchtime hour as deep tropical moisture rushes north. Temps will start in the low to mid 30’s this morning and rise into the upper 30’s to low 40’s this afternoon. With strong onshore winds and astronomically high tides, watch out for some minor coastal flooding in the typically vulnerable areas this afternoon especially south of Portland. Precip will become lighter and spottier for the entire region this evening, with cold air beginning to rush back into the area tonight. As this happens, watch for black ice to rapidly develop on previously wet roads. Graphics used in this post come from weathermodels.com, an excellent source for weather data visualizations if you’re interested in going a little bit more in depth with your weather watching. Nice analysis! I believe my location in the foothills we’ll be mostly if not all snow. We have a brisk NE wind and cooler drier air has adverted in which I believe will aid in keeping it mostly snow. We were 31F when the precip started this morning so it’s been all snow even at light intensities. Still waiting for the big burst to move in.